TIMESUMMARY is a site for staff time management. It is a cross platform multimodal product developed for comprehensive automatized track and analysis of working time in the company. 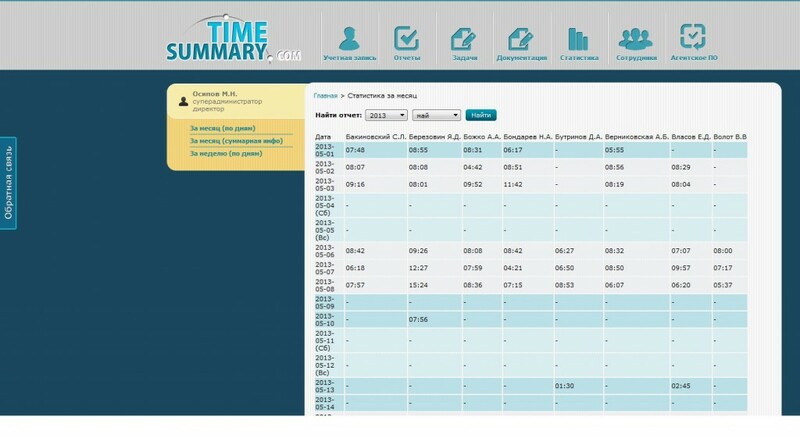 In relation to requirements of every concrete Client, TIMESUMMARY may be used either just on a primitive basis — to keep records on employees arriving late and their working time, capturing and automatized analysis of screenshots of all the working desks, — to comprehensive analytics of man-hours and time input broken down by projects and iterations.